The former Michigan State co-captain took another way to the top after trying as a player. PORTLAND – Wes McCauley’s proudest career moment didn’t come during the National Hockey League playoffs. It didn’t come under the roof of one of the game’s hallowed cathedrals. It came during a minor-league game in Dayton, Ohio, when McCauley, a South Portland resident now in his fifth year as an NHL referee, officiated an ECHL game that marked the professional debut of his younger brother, Blaine. It was the best of many memorable moments he has experienced as an official in the glamorous world of professional hockey. McCauley, 38, is spending the offseason as a stay-at-home dad in South Portland, where he lives with his wife, Bethany, and their three children, Riley, Emma and Maggie. His season ended after the first round of the NHL playoffs, and he’s making up for family time lost on road trips to Vancouver, south Florida and Buffalo. At the same time, he’s training to meet the NHL’s fitness standards for referees and linesmen. He may be home, but he’s never far from work. When he watches his oldest son play baseball, for example, he does it with a particular understanding of what it takes to follow and enforce the rules. McCauley’s playing career ended in 1997 because of injuries. After he met Bethany, who grew up in South Portland, he embarked on a career path that took him through minor-league hockey in Ontario, the ECHL, the AHL and finally to the NHL. He refereed his first NHL game in 2003 in Columbus — about 70 miles east of where he refereed his younger brother’s ECHL game. 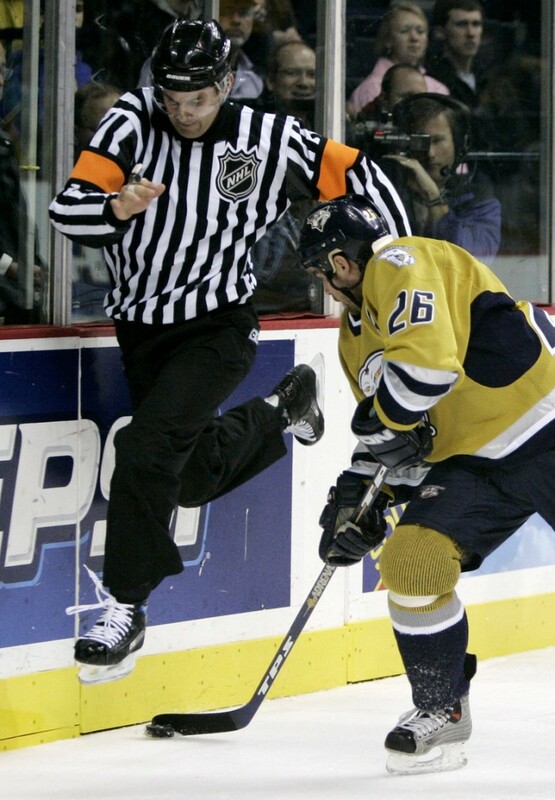 He became a full-time NHL referee prior to the 2005-2006 season, after the NHL lockout. McCauley prides himself on knowing the rules — even the obscure ones. 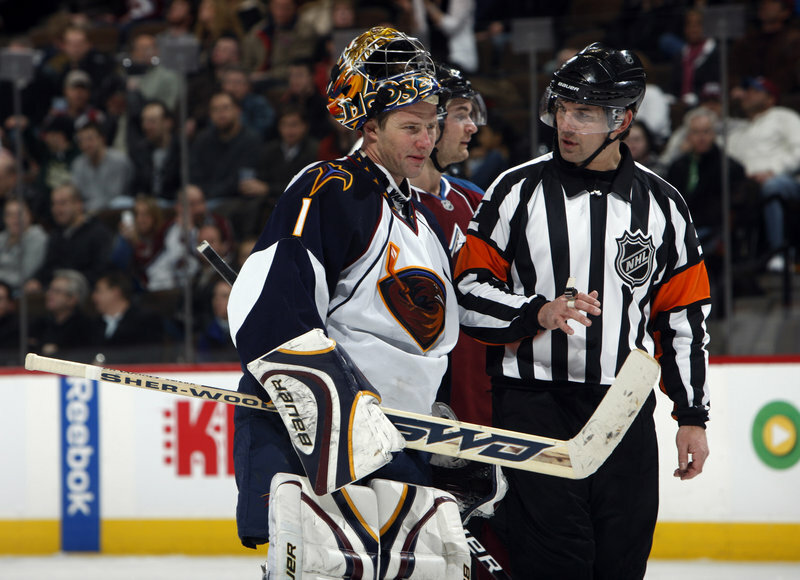 In the spring of 2003, for example, McCauley was officiating an American Hockey League first-round playoff game between the Hershey Bears and the Chicago Wolves. With the Wolves on offense, a delayed high-sticking penalty was called against Hershey and Chicago pulled its goalie. A shot from the point deflected off a Hershey skater and amazingly ended up in the open net. McCauley whistled the play dead, ruled that the goal did not count and skated over to the bench, where then-Hershey coach Mike Foligno glared directly at him. “Here’s the rule,” McCauley told him, explaining why the goal was disallowed. (Per the rulebook, the team that takes the penalty cannot score a goal unless the other team puts it directly in its own net.) “You’re right, aren’t you?” Foligno said. It was one of those key moments, McCauley believed, that helped him establish confidence in himself and credibility as a referee. Smolinski met McCauley when they were 17 years old and about to begin four years with the Michigan State hockey team. Smolinski remembers McCauley on the ice as a hard-nosed defenseman who stood his ground, and off the ice, as a person who had a penchant for learning the nuances of the game. Like Smolinski, McCauley dreamed of playing in the NHL. In the spring of 1990, the Boston Bruins took Smolinski in the first round of the 1990 NHL Draft, while the Detroit Red Wings took McCauley in the eighth round. “For anyone in the hockey world, you think you’re going to make it to the NHL,” said Smolinski, who co-captained the Spartans with McCauley in the 1992-1993 season. “You think you’re going to move on and go to some sort of next level. “Wes was kind of hampered. He was a low draft pick and didn’t have a lot of clout. Wes worked from the bottom up. Since McCauley began his NHL career in 2003, he’s seen the game change. The players have become more skilled, talented and dynamic — the post-lockout NHL has gone from Mario Lemieux, Brett Hull and Mark Messier to Sidney Crosby, Alex Ovechkin and Jonathan Toews — but teams today are defined by their depth, not just by star players. As the game evolved, the standards for refereeing evolved, bringing about a swifter enforcement of the rules. “There was a bit of an adjustment with the standard of enforcement,” McCauley explained. This spring, McCauley was selected as one of 40 referees to officiate the first round of the NHL playoffs and was on the ice for two notable games. The first was Game 6 of the first-round series between the Pittsburgh Penguins and Ottawa Senators, when Pascal Dupuis’ overtime goal won the series. The other was Game 3 of the Colorado-San Jose series when San Jose defenseman Dan Boyle shot the puck into his own net in overtime to give Colorado a 1-0 win. McCauley’s dream is to officiate the Stanley Cup finals. But he also maintains perspective on his craft.